Homecrest began as an offspring of a retail furniture shop in Wadena, Minn. in 1953, when founders Mert Bottemiller and Al Engelmann set out to build a better hassock (now more commonly known as an ottoman) than their vendors could supply. They soon expanded their business into manufacturing with a growing line of indoor and outdoor patio furniture. Bottemiller's swivel rocker mechanism, patented in 1956, was at the foundation of the Homecrest outdoor patio furniture line, which took off in the 1960s as Americans increasingly enjoyed backyard dining, entertaining and recreation. The popularity of Homecrest products soared and distribution extended nationwide. As retail sales prospered, distribution expanded into new markets including international, and contract for resorts, restaurants and health care. The Homecrest outdoor patio furniture line also grew, with a stream of new collections, products and innovations including: self-adjusting chaise, swivel rocker recliner and chaise, gliders, padded slings and technically innovative fabrics, very low maintenance aluminum mesh, and the popular Comfort Recliner. In the late 1990s, Baby Boomers began to fervently embrace their outdoor environments and seek more outdoor patio furnishings to satisfy their growing desire to nest and socialize with friends and family. This movement also generated increased competition from lower priced import products and other market changes, which created numerous business challenges for Homecrest. In response to the rapidly evolving outdoor living market, Homecrest has been redefined with new leaders, owners, and manufacturing strategies, and a bold new emphasis on marketing and trend-driven design. Building upon the brand's heritage of quality, performance and comfort, Homecrest's focus has broadened to encompass the demands of increasingly sophisticated, style-driven consumers seeking to complement their homes' interior designs and create a seamless flow between indoor and outdoor living spaces. The latest Homecrest collections reflect this trend, highlighted by timeless frame designs and finishes, fashionable fabrics, comfortable seating options and an array of metal and Natural Series table tops. Comfort Recliner, The Original Swivel Rocker, Single Glider/Gliding Ottoman, Swivel Balcony Chairs, Fire Tables, Cirque, Airo2 and Natural Series Table Tops. The original Swivel Rocker mechanism, patented by Homecrest in 1956, was at the foundation of the Homecrest outdoor product line, which took off in the 1960s as Americans increasingly enjoyed backyard dining, entertaining and recreation. The popularity of Homecrest products soared and distribution extended nationwide. 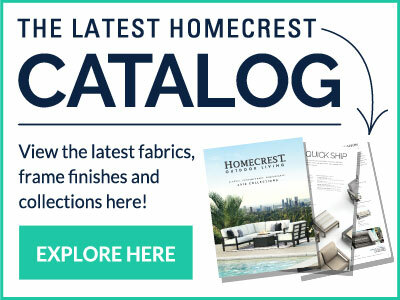 In addition to being one of the first outdoor patio furniture manufacturers in the United States, Homecrest was also the first outdoor furniture manufacturer to use Sunbrella fabrics on outdoor furniture. Homecrest outdoor patio furniture products are offered at specialty, seasonal and furniture retailers across North America. Information on Homecrest's contract market (restaurants, hotels, resorts, etc.) can be found in the Hospitality section.